In 1992, a news article originally published in the Chicago Tribune by Gary Marx swept across America. It described the strange case of a mysterious black blob oozing from the roads in Venezuela. Multiple theories have been put forward to explain the substance, but let us begin with the facts of La Mancha Negra, The Black Stain. La Mancha Negra first appeared in 1987. A mere smudge 50 yards long, it was noticed by work crews as they patched the 30-year-old asphalt on a highway between Caracas and its airport. They didn't think much of it at the time, but soon the blob spread. 100 meters, a mile, soon 8 miles of highway were covered with an unknown material that contracted and expanded with the weather. It grew when conditions were hot and wet, yet shrunk when cold and dry. It seemed to prefer tunnels and the uphill slopes outside the airport. Venezuelans described driving on La Mancha Negra as "a grand prix" that required extreme caution, turning the roads "slick as ice". It seems that despite its gummy texture, the blob rendered the roadway extraordinarily unsafe, causing vehicles to crash into one another or run off the road. But, come on, we've never heard of this! It seems like just a big, out-dated nuisance, right? Wrong. By the time the article came out in 1992, there were 1,800 DEATHS attributed to La Mancha Negra over the past five years. Obviously, somebody had to do something. So, the government stepped in, claiming that it devoted "millions of dollars" to investigating the problem, even consulting experts in the U.S., Canada, and Europe. They tried spraying the stain away with pressurized water, but this didn't work. They tried scrubbing it away with detergents to no avail. They even repeatedly scraped away the top layer of the roads, resurfacing it, only to watch La Mancha Negra reappear. Finally, the government poured tons of pulverized limestone over the stain to 'dry it up'. This seemed to work for a while, but created a different problem. The roads then became so dusty that drivers and local residents complained that the air was unbreathable. 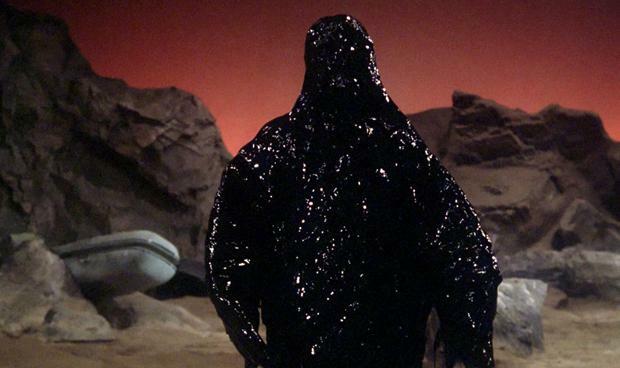 There are various theories as to what the blob is and who created it. 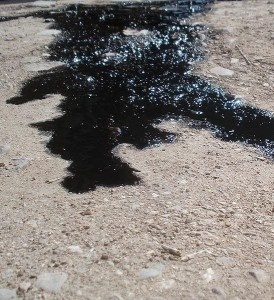 The most common theory was that La Mancha Negra is oil that's seeping from sub-standard asphalt. Somebody in Venezuela got rich, in other words, by providing poor quality materials to the road company. Par for the course for a government many thought to be hopelessly corrupt. Others believe that La Mancha Negra was the result of countless leaky, old cars spraying their fluids over the roadway. Still others believe that the blob was a concerted effort on the part of President Carlos Andres Perez's enemies to ruin his cabinet's reputation. Finally, some believed that raw sewage from nearby slums was running downhill, under the asphalt, and causing a chemical reaction that broke the roads down. And then, of course, there are people who believe it's aliens. From some cursory internet-investigation into asphalt, it was difficult to find any industry sources that could comment on exactly what La Mancha Negra might have been. At best, asphalt providers remind the public to properly seal their surfaces, and that oil and brake fluid can cause the binders in asphalt to deteriorate. So, it does seem like the "leaky cars" theory might hold a bit of water. However, I think the most disturbing things about La Mancha Negra are all the other problems it indicates, but bypasses. Firstly, it's incredibly difficult to get any recent information about La Mancha Negra. There is a short blog post by a tourist in 2008 who noted how a taxi driver refused to take a particular route, citing fears of La Mancha Negra. And then there's an article in Mundo Esoterico y Paranormal which mostly rephrases the original Chicago Tribune article, even going so far as to cite the events of La Mancha Negra as beginning "five years ago", which cashes out to mean 2007 instead of 1987. The comments on the MEP article are very interesting though, with some Venezuelans exclaiming that they'd never heard of La Mancha Negra. The point being: for a phenomenon that has killed 1,800 people (and that's only in 1992, God only knows what the count is today), why do we know so little about it? Is this just something that the people of Venezuela have gotten used to? Has it been solved? If the Venezuelan government spent millions of bucks on it, then why didn't they issue a press release letting anybody know they figured out the cause?! Even worse: how horrible are the slums that they melt the roads?! I wish I had a means of learning more about this strange phenomenon, but short of visiting Caracas myself, I'm not sure whether that'll ever happen. Suffice to say, the world is a strange place.